For the third year in a row, Women in Tech gathers 1000 attendees who are willing to network, share insights in the tech industry, and get inspired by influential speakers in Stockholm. This year the event registered the record interest. 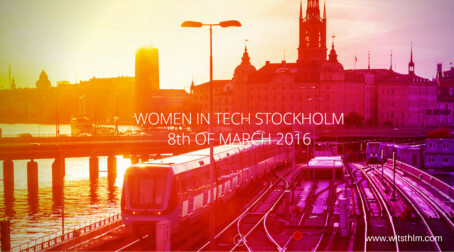 Almost 9 000 people were willing to take part, making Women in Tech the ultimate biggest and most popular tech conference for women in Sweden. In a few weeks from now, Women in Tech participants will listen to speakers coming from the leading tech and media companies. The keynote speeches will focus on such topics as disruptive technologies and exponential thinking, building world-class products, and career journeys to the top. The panel discussions will open the dialogs about the future female entrepreneurs, strategies to drive transformation through technology, and insights on how to attract more female talent to the industry. Sigma shares the mission of the conference and believes that women make a big change in technology and IT. On the conference day the company will host a morning session at Valhallavägen 117 G. Sigma speakers will tell how to build a successful career in the field of technology and will talk about work & life in the international organization, sustainable future, Sigma’s women society and education initiatives. Welcome to Sigma’s morning session at our office on Valhallavägen 117 G. Have you ever wondered how to fit both challenging work and commitment to society in your schedule? How to cultivate the culture of constant learning in your team? How to build a dream career and work with world leading technologies & the companies of tomorrow? At Sigma our values are passion and execution, and our promise to our customers, employees and society as a whole is to “Expect a better tomorrow”. Come and learn even more about work & life in the international organization, sustainable future, our women society and education initiatives.